The Black family history is as fascinating as the de Mestre family into which Mary Ann Black married. Taken from a document by Helen M Booth, g.g.g.g.grand-daughter. John Black, the eldest son but the fourth child of James Black and his wife Barbary Keird (aka Barbara Kerd), was baptised on the 13th September 1753 in the village of Guthrie, Angus, Scotland. John did not have a formal education but appeared to be a natural learner and had some private tuition in Edinburgh and may have attended a private Academy in London. It was in London that John took Deacons orders on the 25th May 1777. From letters dated the 7th May and 12th May 1777, Norman Sievewright, a minister of the licensed Chapel at Brechin, gives testimonial for John Black. Norman Sievewright states that John Black formerly resided in Brechin then in Montrose until the spring of 1776 but now lives in London also that he had been personally acquainted with John since he was a boy. He also says that John became a member of his congregation and has taken Holy Communion, he also testifies to Johns pious disposition and his love of learning and ingenuity. The testimonial is also sponsored by Daniel Allardice of Menus and John Spence of Bearhill, Commissary of Brechin, who are both JPs for the County of Forfar. John Black is known to them as a young man of unblemished character and good disposition. The other letter is from Alexander Alison of Edinburgh and he says that John Black came to Edinburgh in April or May of 1776 and he had met him at a friends house. I found that he had a pious cast of mind and a great turn at reading but had not the opportunities in the first part of his life, of pursuing his Genius which lay to letters and the Clergy. Alexander Alison also mentions that John Black had married a young woman who was living with her mother as Black was unable to support her. Alison had advised Black to go to some classes, which he did for the short time he was in Edinburgh. In London Alison believes that John had been to a private Academy to study for the Church since September or October last (1776). John Blacks first church was St. Nicholas, Yarmouth, Norfolk, where he was sent after receiving his Deacons papers. He was recording and announcing marriage banns there from 1777 to 1779. It was at Yarmouth that John and May celebrated the birth of their first child, a son, who was named after his father. 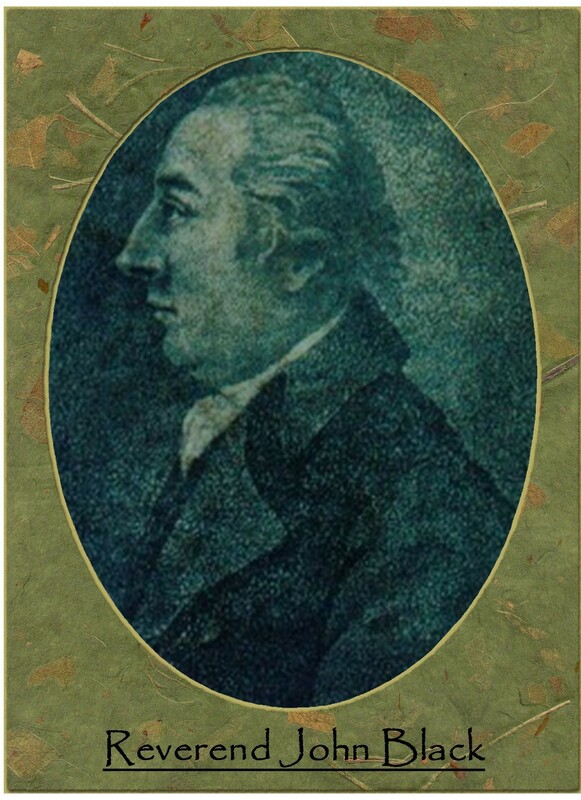 John was born on the 31st October 1778 and baptised on the 29th November 1778. On the 25th August 1783 John Black wrote to the Bishop of Norwich, acquainting the Bishop that he intended taking Priests orders at Michaelmas. He added testimonials from a fellow Curate and his Deacons orders. This letter was written at Woodbridge. The testimonial letters, dated the 23rd August 1783 was from Thomas Carthew (Perpetual Curate) Clerk and rector of Little Bealings in Suffolk, a Diocese of Norwich, nominates John Black, Clerk, to perform the office of Curate at Little Bealings and promises to pay him £25. The second letter of the same date to the Bishop of Norwich, states that John Black has been known for the past three years and testified for his good behaviour, that he lived piously, soberly and honestly and had diligently applied himself to his studies. It is signed by: Thomas Carthew, Curate of Woodbridge, Jos. Gunning, Vicar of Sutton, R. L. Frank, Rector of Alterton, L. G. Spurgeon, Rector of Alton. Other letters followed. On the 9th September the Bishop was sent another letter to testify that publication was made on the previous Sunday, in the Parish Church at Woodbridge, Suffolk, at the time of the divine service, that John Black of this Parish, Clerk, did intend to offer himself as a candidate at the next Ordination to be admitted to the Holy order of Priest. Signed by: Thom. Carthew, Curate of Woodbridge, W. Couperthwaite, Churchwarden, Robert Loder, Churchwarden. From 1778 to 1795, May bore a total of ten children only three of which are known to have married. John their eldest son marrying Mary Ann Hide in 1801. John and May continued to live in Woodbridge, Suffolk with John serving the town in a number of ways. He was Curate at Butley from 1789 to 1813. He was also Chaplain at the Woodbridge House of Correction and Headmaster of the Woodbridge Free School 1800-1806. Also he was Chaplain at the camp at Bromeswell. This was thought to have been an encampment of soldiers who were present in very large numbers during the Napoleonic Wars. Woodbridge was a garrison town and in 1803 had 655 cavalrymen and 4000 troops, mostly Irish. The Reverend John Black, a poet of some importance and an excellent classical scholar, resided for many years at Woodbridge and died there on the 30th August 1813. John Black was born on the 31st October 1778 in Great Yarmouth, England and was christened on the 29th November 1778.1 He was the eldest son of John Black (1753-1813) and May Logie (Christened 1747). At the time of his birth his father, the Rev. John Black, was curate to St. Marys, Great Yarmouth, having been ordained a deacon by the Bishop of London in 1777, and the family resided there until 1779 when they moved to Woodbridge, Suffolk. It is possible that this move was a result of the Rev. John Black being offered a living at Woodbridge. In 1783 the Rev. Black was ordained a priest and was licensed to the Curacy of the Church at Little Bealings; in 1793 he was appointed Chaplain to the House of Correction at Woodbridge; in 1789 he was licensed to the curacy of Butley; in 1800 he was appointed Master of the Woodbridge School; and in 1806 he was appointed Curate of Ramshort resigning from his Headmastership of the School in 1807.2 John Black therefore spent his formative years in Woodbridge and it is probable that he attended the Woodbridge School. He was a sailor and had many adventures, one which concerned the mutiny of the Lady Shore. From John Black's journals the Rev. John Black published A Narrative of the Mutiny on Board the Ship Lady Shore. In about 1795, at the age of 17 years, John Black joined the Indiaman, the Walpole.3 Information on his career is next gleaned from a letter John Black wrote to his father on the 1st May 1797 from the Lady Shore whilst at Torbay. The Lady Shore was bound for Port Jackson with a consignment of convicts and much-needed supplies of food and farm implements for the Colony. On the 8th June, 1797 the Lady Shore left Falmouth in company with the West-India Fleet for 10 days and upon withdrawing from that fleet, fell in with the Intrepid and the East-India Fleet. John described the soldiers as the most disagreeable, mutinous set of villains that ever entered a ship and expressed the sincere wish that "we were now lying at Port Jackson delivering our precious cargo. On the 1st August, 1797 when the ship was four days sail from Rio de Janeiro the N.S.W. Corps and several of the sailors mutinied. They quickly took over the ship during which time Captain Willcox and the Chief Mate, Lambert, were killed. During the afternoon of the 14th August, 1797 John Black (the purser and navigating officer), the second and third mates, the steward, the cabin boy, the commanding officer of the company of soldiers on board and his wife, five other officers, two privates, four wives, three children, one male passenger with his wife and two children, three female convicts and one male convict were put in a longboat and cast astern. They were given "three small casks of water, about ninety gallons, four bags of bread and three pieces of salt beef, two hams, two cheeses and a keg with four gallons of rum. The Lady Shore mutineers then sailed away, leaving behind the longboat with twenty-nine men, women and children aboard. The castaways hoisted sail and headed for Rio Grade, the nearest settlement on the Portuguese coast of South America, about 300 miles away. It was later revealed that the mutineers from the Lady Shore were in jail and that all the pretty convict girls were lodged in the homes of Spaniards. The other convict women were confined in jail. The Lady Shore was sold in Monte Video for forty thousand dollars. What happened to the seventy soldiers - the mutineers of the New South Wales Corps, or what happened to the remainder of the sixty six, not so pretty, female convicts who were not taken into homes of the amorous Portuguese is not known. As the convey being organised in Rio Janeiro would not reach England before eight months and sick at the thoughts of being idle for so long a time4 John Black joined the Indispensable (privateer, 14 guns, crew 32) as navigator and sailed from Rio Janeiro on the 20th January 1798. In a letter to his father dated 15th April 1798 John Black disclosed that he had last night arrived at the Cape of Good Hope in charge of the Spanish prize La Union of Malaga which Captain William Wilkinson and his crew had captured whilst it was on a voyage from the River Plate to Lima on the coast of Peru.4 It took almost two months to dispose of the prize and her cargo of tallow, candles, dried beef, etc. and to lay in an investment to sell in Port Jackson and it was not until the 7th June 1798 that John Black wrote a letter to his father advising him of their intention to sail the following night for Port Jackson.4 The Indispensable captained by William Wilkinson had previously visited Port Jackson in May 1794 departing for Bengal in July7 and also in April 1796 where he delivered 131 female convicts.7a. On that trip the Indispensable lingered at Port Jackson until the 21st September 1796 and this time would have provided Captain Wilkinson with an insight as to the type of cargo that would raise the most money in Port Jackson. It would appear that the Indispensable arrived in Port Jackson in early August (the duration of the voyage between the Cape and Port Jackson at that time was approximately 2 months) and it was a stormy passage across the Indian Ocean around the south of Van Diemens Land, when the ship lost two boats and one man overboard. The same storm stove in two boats and carried away several spars.5 The above information was contained in a letter written by John Black to his father on the 8th September 1798 and reprinted in the St. James Chronicle of 31st October 1799. "Dear Father", he wrote, "I am still amongst the living. By my last letter I informed you of having laid in an investment at the Cape for this place. The market is very bad. The Barwell brought a large cargo from England, a vessel from Bengal and an American vessel with cargo of tabasco and spirits. (This was the Argo, a small American schooner having on board a cargo of salt provisions, some French Brandy, and other articles, upon speculation, all of which was brought to a good market. Sydney Cove 1795-1800 John Cobley). These vessels have drained the place of all cash. Wheat, corn, beans, cabbages and fruit trees flourish, the cattle are of an uncommon size, and very fierce. An old horse, which in England would be valued at five pounds for dog's meat, sells here for 100 guineas." He then goes on to say that he chased a flock of black swans fifteen miles down the river, but never got a shot at them as they are so very shy. He mentions that the Governor (John Hunter) is a pleasant, sensible old man. He also described the harbour as "one of the best in the known world" and expected in a fortnight to sail on a cruise for two months to fish. It was about this time that John Black met Mary Hide/Hyde and they lived together without the formality of marriage. Mary Hyde alias Sarah Blunn, had been sentenced at the Warwick Assizes in 1796 to seven years transportation beyond the seas. She had arrived on the Britannia Whaler on the 18th July 1798 together with 94 other female convicts, who were forthwith landed, and some of them were sent to Parramatta and Toongabbie.7 There were two comments recorded on the arrival of the Britannia Whaler; the first being made by David Collins in An Account of the English Colony in New South Wales (see additional Notes) wherein he stated that The cattle that were brought in the Hunger, and which were sold by auction at this time, were not greater objects of contest than were these females, the number of women in the settlements bearing no proportion to the men.7 and the second in a letter from Stephen Hutchinson to John Foyle on the 5th September 1798 As soon as we came to an anchor the decks were crowded with gentlemen settlers and men convicts, who came, some to chuse servants, and some to chuse wives, as they pleese to call them, when those who were pitched upon were landed. The others were taken in open boats up the River to a Settlement called Paramatta. When they arrived there the gentlemen after picking out those they wanted for different uses gave the others their free will, to go with any man they chose, those who did not go with one man, were sent to be hut keepers that is to take care of huts in which there are from two to ten men. There they are obliged to take care of the huts, while the men are at labour, if a virtuous woman, as there may be among female convicts, should fall to that unfortunate lot of being a hut keeper, I leave you to judge how disagreeable it must be to her, but what must the unfortunate creatures do, when there is no settled house here for them; as soon as they are landed they must either go with a man who perhaps they never saw, be a hut keeper or guest to the hospitality of a stranger. Some to be sure get into places as servants but few places here are of great advantage, and the preference is generally given to but a small house for oneself or do the best a person can, for my part I think that is the best way too, but how can a woman who perhaps has been confined for 3 or 4 years and Leaves England without a penny, or even clothing, give at least 9 or 10 pounds for a small house, and if she could a lonely woman is a poor thing in a Country where there are so many villains; it is true that a Government, if it is known, will not let a woman be ill used, but yet I find it is very common for some of these villains to obtain an order for to land a woman to live with him and when he has had what he can get from her and striped her in a manner of what she had, he turns her out of doors and picks up with another. Never the less many women do well here and if a woman can purchase a house and get a little to trade with, she may make a genteel Livelihood, marry likewise, make a great deal by their handwork, and those who behave themselves will get great notice taken of them.7 It is interesting to note that the 1811 Muster showed that Mary Hide had arrived at Port Jackson in the Indispensable. The Indispensable arrived back in Sydney Harbour on the 29th December 1798 after a cruise 32°-35°S within 90 miles of the coast laden with .54 tons spermaceti oil.8 It was reported by Collins that the whalers Indispensable and Britannia, which has been fishing off the coast, put in to refit on the 29th7 The boat required a refit and thus stayed in port for some considerable time.8 The Britannia Whaler was the same vessel that arrived in Port Jackson carrying Mary Hyde and 93 other female convicts. In March 1799 Governor Hunter granted a lease of land to Mr. John Black, late purser of the Lady Shore transport. This allotment is shown on surveyor James Meehans map of Sydney on the eastern side of George Street, between Hunter Street and Martin Place. While John Black sailed in and out of Sydney on fishing voyages, Mary Hyde resided on this allotment.6 On the 31st May 1799 John Henry Black, son of John Black and Mary Hyde was born. John Black and Mary Hydes son, John Henry Black, was baptised on the 2nd September 1799 and it must have been not long after that time that John Black sailed for Cape Town, either in the Indispensable returning to England with its cargo of spermaceti oil or perhaps in his Majestys ship Buffalo which sailed for the Cape on the 15th September to return with cattle for the colony. Whilst passing through Bass Trait the Harbinger discovered a large island, which Captain Black named King Island after the Governor of New South Wales and also the Hogan group of islands. The Harbinger embarked on an investigation of the strait tracking around Cape Otway, Cape Danger and Cape Patten down to the northern part of King Island and around Wilsons Promontory. 10 A chart drawn later by Governor P.G. King shows John Blacks course through Bass Strait.11 Gov. Kings report on the voyage reads A small brig from the Cape of Good Hope, commanded by Mr. Black (a person of good abilities as a surveyor and navigator) passed thro and keeping more to the Southward made Cape Albany Otway and standing to the southward made an island lying in the centre of the west entrance of the strait which he named King Island and afterwards passed thro the centre of the strait unadvisable to attempt from the east only from the west. A copy of Blacks writing on the passage through Bass Strait in the Harbinger was sent to England with Kings letter. On the 7th September 1801 Governor Philip Gidley King granted to Mary Hyde an Absolute Pardon. The document issued to her read "BY VIRTUE of such power and authority as vested as aforesaid I PHILIP GIDLEY KING ESQUIRE Captain General and Governor in Chief in and over the said Territory of New South Wales and its Dependencies taking into consideration the Exemplary Good Conduct of MARY HYDE and at the particular recommendation of Mr. John Black DO hereby ABSOLUTELY Remit the remainder of the Term or Time which is yet to come and unexpired of the Original Sentence or Term of transporation..in the name MARY HYDE. It would appear that John Black used his credit with Governor King to gain this Absolute Pardon for Mary. 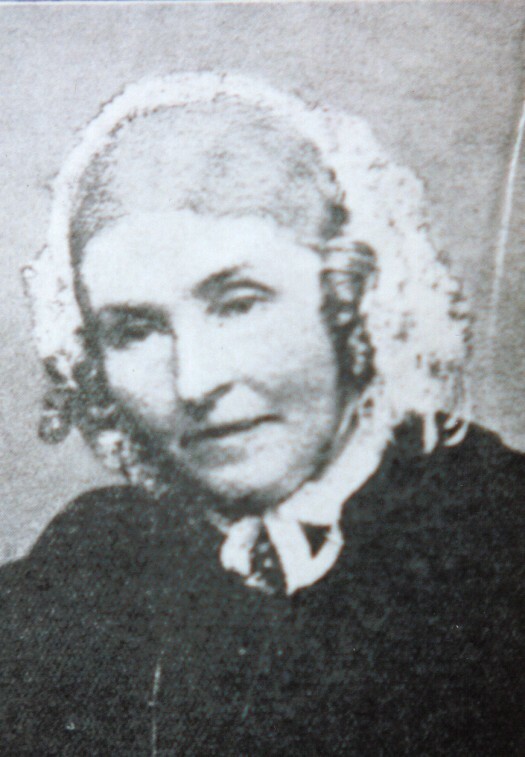 John Black's and Mary Hyde's second child, Mary Ann Black, was born on the 1st October, 1801. The Sydney Gazette of 15th April 1804 confirmed the death as follows The brig Fly, Captain Black, that sailed from Calcutta for this colony on April 1802 has never been heard of. 7(a) Sydney Cove 1795-1800 by John Cobley, Angus and Robertson 1986. 11 Photocopy of untitled book Chapter 39, page 229 John Black in the Harbinger. Fishing trips, returned to England on the 2nd December 1799. Michael Hogan Michael Hogan is mentioned in both Convict Ships 1787-1868 by Charles Bateson and Sydney Cove by John Cobley as the Master of the ship Marquis Cornwallis which arrived in Port Jackson from Ireland carrying 233 male and female convicts. During the voyage Hogan and his crew quelled a proposed insurrection. In a letter to King dated April 1796, Gov. Hunter stated that Captain Hogan of the Marquis Cornwallis had bought a farm at the Hawksbury and intended to seek government permission to open a store at Sydney. In May 1796 Michael Hogan was brought before the Court of Civil Jurisdiction accused by repeatedly striking the ships surgeon, Matthew Austin, with Bamboo. The surgeon further made oath that Michael Hogan improperly applied the wine that was put on the ship Marquis Cornwallis, for the use of the Convicts on their passage to New South Wales. The court found a verdict against Michael Hogan and it was adjudged that he should pay to the Plaintiff the sum of fifty pounds. A general muster of inhabitants at the Hawkesbury together with the state of their farms made in July 1999 found that one of the largest quantity of ground was held by a man of the name Flood (who had been left by Mr. Hogan, when here in the ship Marquis Cornwallis in 1796, in the care of some ground which that gentleman had purchased) had at this time 200 acres. Collins In order to gain further insight on the Colony of New South Wales during the period 1798 to 1802 it is suggested that the writings of David Collins be investigated. The conditions in Sydney in 1798 It was reported by John Cobley that the weather was much colder than common and that the interior part of the country suffered sharp frosts during the night in both July and August . Hunter wrote to Portland in September 1798 that clothing and bedding were in very short supply and some convicts were nearly naked. Attempts had been made to make cloth from the bark of a tree. He had encouraged the rearing of swine and taken more pork into the store recently. He asked that any instructions which had been sent in the Lady Shore should be repeated and requested a much more liberal supply of stationery. Mary Ann Black, born in Sydney, was the daughter of John Black and Mary Ann Hide (Hyde), both originally from England. Mary Ann married Prosper in 1821 in St Phillip's Church of England, Sydney. Although very little is known about the family's private life; she was, however, according to the Shoalhaven Centenary Booklet (1926), of a highly estimable character, sincerely attached to her friends, of a restless activity, honestly frank, and possessing of a keen understanding. She "was a fine example of the womanhood of the "lace and lavender" period, a home-builder, and an indefatigable worker for the well-being of the people, in the social life of whom she was a conspicuous figure, and a noted benefactress in providing churches, and schools for the settlement (Terara)." Between 1821 and 1841, Mary Ann gave birth to ten children. Their first child, Prosper John, was born on 29 December 1821, and the Sydney Gazette carried the announcement, at a time when very few birth notices were made. Following Prosper's death in 1844, Mary Ann, who outlived her husband by seventeen years, turned the hobby farm at Terara into a profitable dairy farm and had three wharves built on the Shoalhaven River in 1854 as well as a flourmill and sawmill in the village. On 26 July 1856 St John's Church of England was opened at Terara. It cost £700, the greater part of this being given by Mary Ann who also donated the site near her house. An account of the church is given in Empire (15 June, 1856). Mary Ann died at the home of her daughter, Mrs Williams (Helen Mary de Mestre) of Fort Street, on July 11, 1861 and was buried in the Old Protestant Cemetery.